GIRATUBI CON GANASCE 83 30 015 KNIPEX. 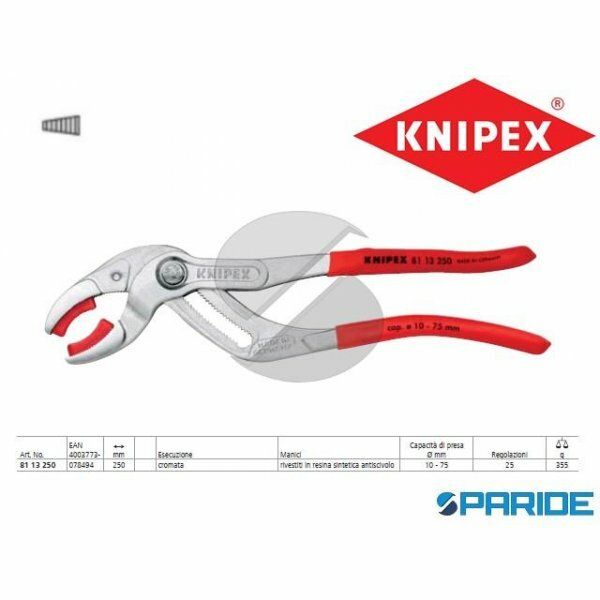 GIRATUBI VERNICIATA A POLVERE COLORE ROSSO CON GANASCE STRETTE A "S"; DENTI CONTRARI AL SENSO DI ROTAZIONE; DENTATURA ULTERIORMENTE TEMPERATA..
PINZA CHIAVE 86 43 250 KNIPEX. PINZA CROMATA CON MANICI RIVESTITI IN RESINA SINTETICA. SOSTITUISCE UN INTERO ASSORTIMENTO DI CHIAVI METRICHE E IN POLLICI; BECCHI PIATTI PER INSTALL..
PINZA CHIAVE REGOLABILE 86 03 125 KNIPEX. PINZA CROMATA CON MANICI RIVESTITI IN RESINA SINTETICA. SOSTITUISCE UN INTERO ASSORTIMENTO DI CHIAVI METRICHE E IN POLLICI; BECCHI PIATTI ..
PINZA CHIAVE REGOLABILE 86 03 150 KNIPEX. PINZA CROMATA CON MANICI RIVESTITI IN RESINA SINTETICA. 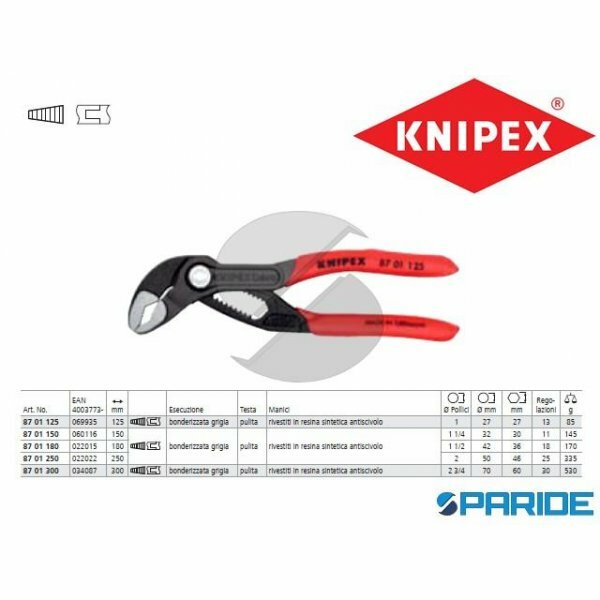 SOSTITUISCE UN INTERO ASSORTIMENTO DI CHIAVI METRICHE E IN POLLICI; BECCHI PIATTI ..
PINZA CHIAVE REGOLABILE 86 03 180 KNIPEX. PINZA CROMATA CON MANICI RIVESTITI IN RESINA SINTETICA. 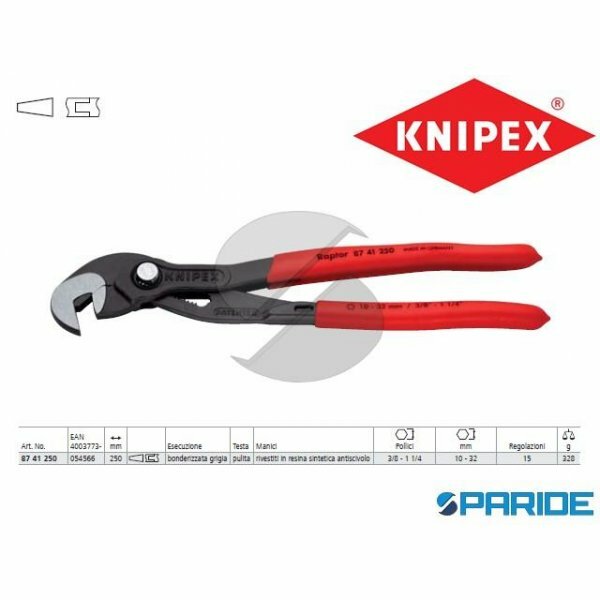 SOSTITUISCE UN INTERO ASSORTIMENTO DI CHIAVI METRICHE E IN POLLICI; BECCHI PIATTI ..
PINZA CHIAVE REGOLABILE 86 03 250 KNIPEX. PINZA CROMATA CON MANICI RIVESTITI IN RESINA SINTETICA. SOSTITUISCE UN INTERO ASSORTIMENTO DI CHIAVI METRICHE E IN POLLICI; BECCHI PIATTI ..
PINZA CHIAVE REGOLABILE 86 03 300 KNIPEX. PINZA CROMATA CON MANICI RIVESTITI IN RESINA SINTETICA. SOSTITUISCE UN INTERO ASSORTIMENTO DI CHIAVI METRICHE E IN POLLICI; BECCHI PIATTI ..
PINZA CHIAVE TUCANO 87 41 250 KNIPEX. PINZA BONDERIZZATA GRIGIA, TESTA PULITA, MANICI RIVESTITI IN RESINA SINTETICA ANTISCIVOLO. 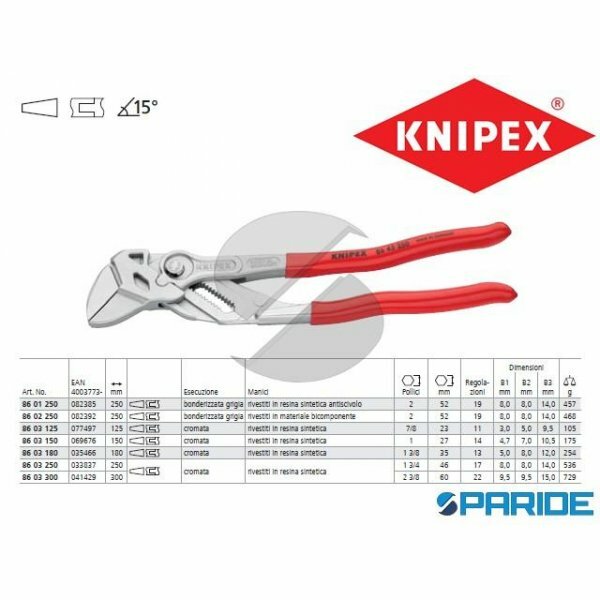 APERTURA CHIAVE DA 10 A 32 MM (3/8" - 1 1/4"); AUTO..
PINZA CHIAVE XL 86 03 400 REGOLABILE KNIPEX. PINZA CROMATA, MANICI RIVESTITI IN RESINA SINTETICA. 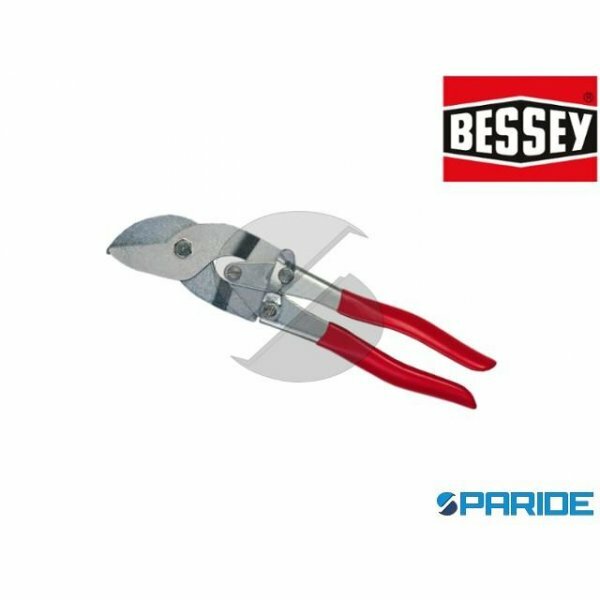 L UTENSILE DI MONTAGGIO UNICO NEL SUO GENERE DISPONIBILE ANCHE NELLA LUNGHEZZA DI ..
PINZA D36 PER RIDURRE TUBI DI LAMIERA BESSEY. LAVORO RAPIDO E RAZIONALE CON 3 GANASCE INFERIORI E 2 SUPERIORI, APERTURA AUTOMATICA, IMPUGNATURA IN PVC, PROFONDITA 28 MM. CODICE PIN..
PINZA PER TUBI E DADI 84 11 200 KNIPEX. PINZA BONDERIZZATA NERA, TESTA PULITA MANICI RIVESTITI IN RESINA SINTETICA. 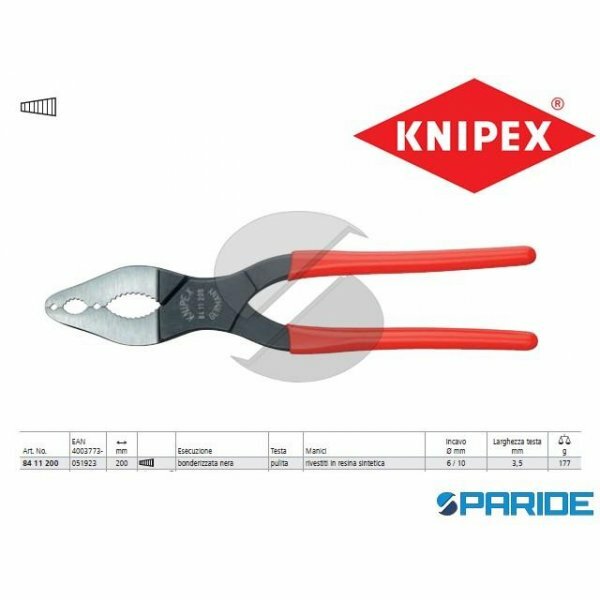 PER RACCORDI PARTICOLARMENTE STRETTI; ACCIAIO SPECIALE PER UTENS..
PINZA PER SIFONI E CONNETTORI 81 03 230 KNIPEX. PINZA CROMATA CON MANICI RIVESTITI IN RESINA SINTETICA ANTISCIVOLO. PER SIFONI, FILTRI OLIO, TUBI DI PLASTICA E CONNETTORI FINO AL D..
PINZA PER SIFONI E CONNETTORI 81 11 250 KNIPEX. PINZA CROMATA, MANICI IN RESINA SINTETICA ANTISCIVOLO CON GANASCE IN RESINA SINTETICA. PER SIFONI, FILTRI OLIO, TUBI DI PLASTICA E C..
PINZA PER SIFONI E CONNETTORI 81 13 250 KNIPEX. PINZA CROMATA, MANICI IN RESINA SINTETICA ANTISCIVOLO CON GANASCE IN RESINA SINTETICA. 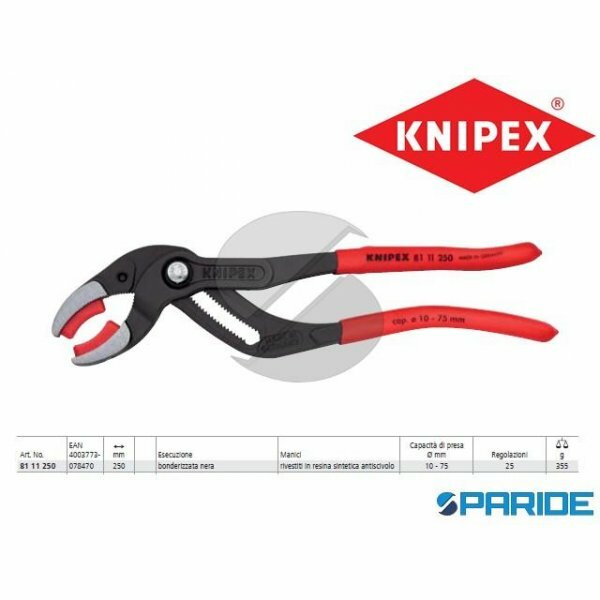 PER SIFONI, FILTRI OLIO, TUBI DI PLASTICA E C..
PINZA PER TUBI E DADI 84 21 200 CURVA KNIPEX. PINZA BONDERIZZATA NERA, TESTA PULITA MANICI RIVESTITI IN RESINA SINTETICA. PER RACCORDI PARTICOLARMENTE STRETTI; ACCIAIO SPECIALE PER..
PINZA REGOLABILE ALLIGATOR 88 01 180 PER TUBI E DADI KNIPEX. PINZA BONDERIZZATA NERA CON MANICI RIVESTITI IN RESINA SINTETICA ANTISCIVOLO. 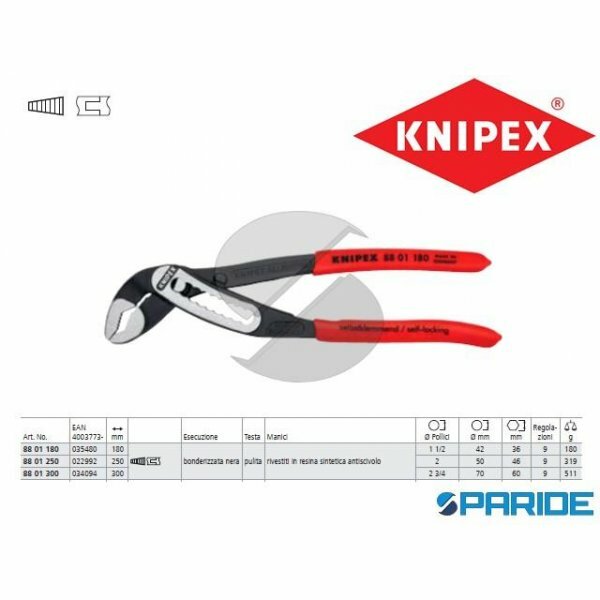 MIGLIORI PRESTAZIONI E COMFORT RISPETTO A..
PINZA REGOLABILE ALLIGATOR 88 01 250 PER TUBI E DADI KNIPEX. PINZA BONDERIZZATA NERA CON MANICI RIVESTITI IN RESINA SINTETICA ANTISCIVOLO. 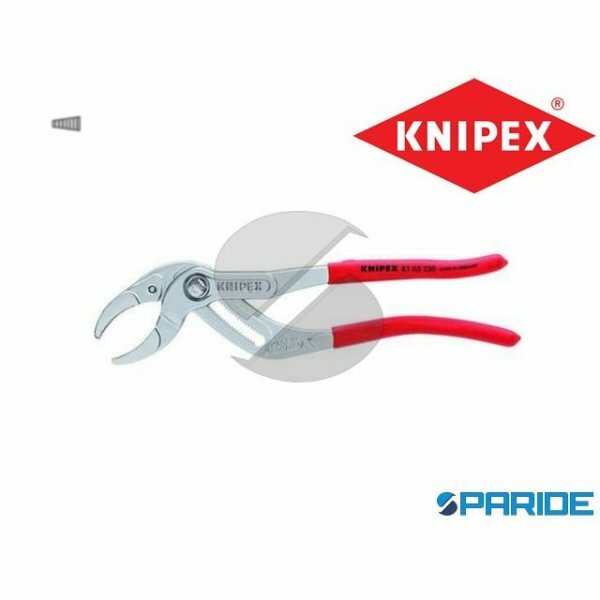 MIGLIORI PRESTAZIONI E COMFORT RISPETTO A..
PINZA REGOLABILE ALLIGATOR 88 01 300 PER TUBI E DADI KNIPEX. PINZA BONDERIZZATA NERA CON MANICI RIVESTITI IN RESINA SINTETICA ANTISCIVOLO. 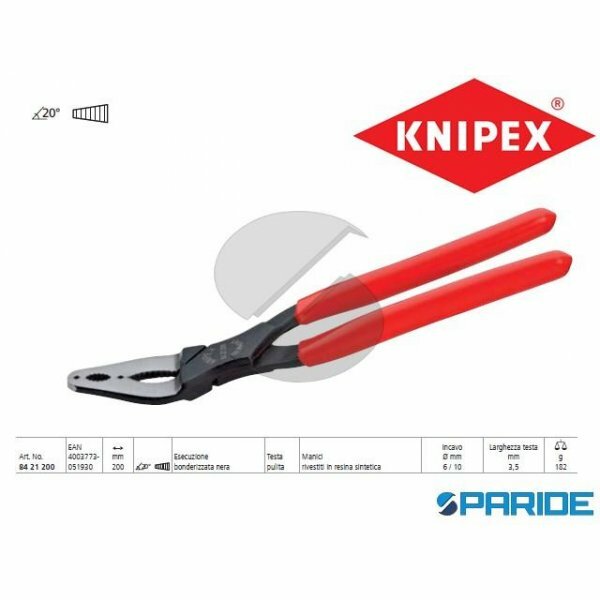 MIGLIORI PRESTAZIONI E COMFORT RISPETTO A..
PINZA REGOLABILE COBRA 87 01 125 PER TUBI E DADI KNIPEX. PINZA BONDERIZZATA GRIGIA, TESTA PULITA, MANICI RIVESTITI IN RESINA SINTETICA ANTISCIVOLO. REGOLAZIONE MEDIANTE PRESSIONE S..
PINZA REGOLABILE COBRA 87 01 150 PER TUBI E DADI KNIPEX. PINZA BONDERIZZATA GRIGIA, TESTA PULITA, MANICI RIVESTITI IN RESINA SINTETICA ANTISCIVOLO. REGOLAZIONE MEDIANTE PRESSIONE S..
PINZA REGOLABILE COBRA 87 01 180 PER TUBI E DADI KNIPEX. PINZA BONDERIZZATA GRIGIA, TESTA PULITA, MANICI RIVESTITI IN RESINA SINTETICA ANTISCIVOLO. REGOLAZIONE MEDIANTE PRESSIONE S..
PINZA REGOLABILE COBRA 87 01 250 PER TUBI E DADI KNIPEX. PINZA BONDERIZZATA GRIGIA, TESTA PULITA, MANICI RIVESTITI IN RESINA SINTETICA ANTISCIVOLO. REGOLAZIONE MEDIANTE PRESSIONE S..
PINZA REGOLABILE COBRA 87 01 300 PER TUBI E DADI KNIPEX. PINZA BONDERIZZATA GRIGIA, TESTA PULITA, MANICI RIVESTITI IN RESINA SINTETICA ANTISCIVOLO. REGOLAZIONE MEDIANTE PRESSIONE S..
PINZA REGOLABILE COBRA 87 01 400 PER TUBI E DADI KNIPEX. PINZA BONDERIZZATA GRIGIA, TESTA PULITA, MANICI RIVESTITI IN RESINA SINTETICA ANTISCIVOLO. REGOLAZIONE MEDIANTE PRESSIONE S..